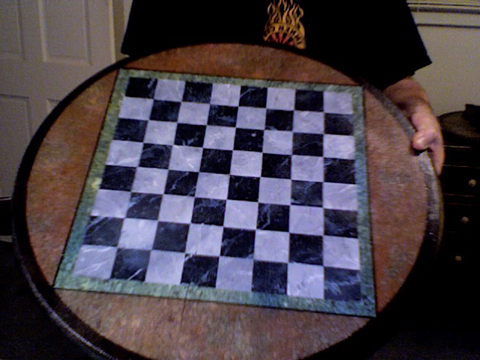 Over the last few years, I've developed an interest in designing and crafting faux stone chess boards. I recently completed this one for Devon. It's 24" in diameter, 1 1/2" thick and rendered with oil paint on a round birch table top. If you think you might enjoy owning a customized chess board and find creative collaboration a kick, please contact me at my e-mail address (john555cox@hotmail.com) to discuss details. This page contains a single entry from the blog posted on September 21, 2013 12:00 AM. The next post in this blog is Magazine Cover Illustration Idea.